The seventh BlizzCon convention is coming in November. It's once again time to gird your loins for BlizzCon, the two-day gaming festival in celebration of all things Blizzard. Taking place more than two years after the previous event, BlizzCon 2013 will offer all the usual good times, including discussion panels with Blizzard personnel, casual and competitive tournaments, eSports finals featuring top international pro gamers, contests, unique merchandise and of course hands-on time with whatever digital entertainment Blizzard happens to be cooking up. 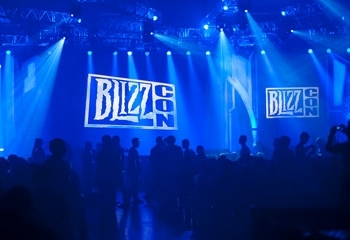 "BlizzCon gives us a chance to connect with our players and share our latest projects in a very personal way," Blizzard co-founder and CEO Mike Morhaime said. "Members from all of our gaming communities have helped make this event bigger and better every time"
The 2013 edition of BlizzCon goes down on November 8 and 9 at the Anaheim Convention Center in Anaheim, California. Tickets are not yet on sale but pricing and other relevant information will be announced at the official BlizzCon website when it becomes available. Gamers who have no concern for such things as money and plan to attend the event regardless of the cost can reserve hotels now through the BlizzCon hotel website. For more information and a look back at previous BlizzCon events, keep your eyes squarely focused on BlizzCon.com.